The makers of singer James Brown's signature capes have agreed to give back one of the costumes the Godfather of Soul never got to wear. Brown's daughter had sued his long-time tailors in a Cleveland, Ohio-area small claims court. Deanna Brown Thomas told The Plain Dealer of Cleveland that she sued Curtis and Marilyn Gibson as a last resort after asking them repeatedly to turn over a silver cape made for her father before he died in late 2006. The Gibsons handed over the cape in a settlement reached just before the case went before a judge. Ms Thomas said she wanted her father's costumes for a museum and that she paid the Gibsons £4,000 for the cape. She told reporters outside court: "I feel good." Mariah Carey and Nick Cannon celebrated their fourth anniversary with another milestone - becoming parents to a baby girl and boy. Ellie Goulding has described the "incredible atmosphere" at Friday night's Buckingham Palace party where she sang for guests of the Queen. U2 star The Edge is a step closer in his long-running battle to build a group of mansion homes in a California beauty spot. 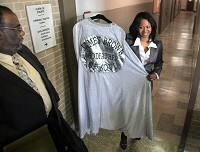 The makers of James Brown's signature capes are being sued over one the Godfather of Soul never got to wear. Bon Jovi have announced that Richie Sambora will miss dates on its current tour amid reports that the guitarist is heading to rehab. Lady Gaga was a winner as MTV debuted its inaugural O Music Awards - eschewing award show traditions and even its own broadcasting power.